Does Russell Wilson's tax day deadline for extension talks have clout? I see you, Russell Wilson. Drawing the proverbial line in the sand. Delivering a stern but not too threatening message. Showing ownership that team-players have self-interests too. When we think of the Seattle Seahawks, who do we think of? You’re the foundation of the franchise, the unequivocal leader of this locker room. At 30, you have many seasons ahead of you.And the organization made sure that your voice carried the most weight behind closed doors. So why shouldn’t the front office commit to you financially once again? How fitting, too, that the extension talks deadline you set is April 15th — Tax Day, the day Uncle Sam demands to receive what he is owed. You clearly deserve to get paid. But will your ultimatum ultimately fall on deaf ears? Wilson is in the final year of the four-year, $87.6 million contract extension he signed in July 2015 and is scheduled to make $17 million in 2019. His goal, however, is to either become the highest-paid player in the NFL (that honor currently belongs to Aaron Rodgers, who makes $33.5 million per year) or the player with the most guaranteed money. But these negotiations aren’t necessarily about what Wilson wants. It’s about what the Seahawks feel like doing. And when. Despite everything the Super Bowl champion and six-time Pro Bowl quarterback means to this organization, he isn’t the one driving this conversation. Yes, he set a deadline. And no, he doesn’t want to engage in contract talks until after the season, should the Seahawks choose not to present a new deal by Monday. But there’s nothing forcing Seattle’s hand. Wilson reportedly still plans to show up to voluntary workouts — removing the threat of a holdout — and is prepared to play out the final year of his current contract if it comes to that. It’s possible that both sides strike a deal quickly in advance of Monday’s looming deadline. The last time Wilson made his demands known, he received a new contract the day before the Seahawks’ 2015 training camp began. That deal made the quarterback the second-highest player in the NFL at the time. This time around, that doesn’t appear likely. Even though Seattle knows it’s a better team with Wilson, it’s not obligated to hammer out a lucrative contract at this very moment. The front office can instead slap him with thefranchise tag in February at over $30 million and work toward a multi-year extension before July 15, 2020 league deadline. Or, the Seahawks could tag him again in 2021 at a little more than $36 million. Wilson may be the face of the franchise. But the Seahawks have the leverage. For now and maybe years to come. Of course, Seattle would be wise to avoid the melodrama that arose from the Washington Redskins’ handling of Kirk Cousins’ contract situation. Perpetually tagging players with no real intention of working out a long-term deal breeds only discontent. Seattle could also opt to trade Wilson before it gets to that point. Consider how the Seahawks have approached other veterans in recent years: They released Richard Sherman. Traded away Michael Bennett. And didn’t cave to the contract demands of Earl Thomas. 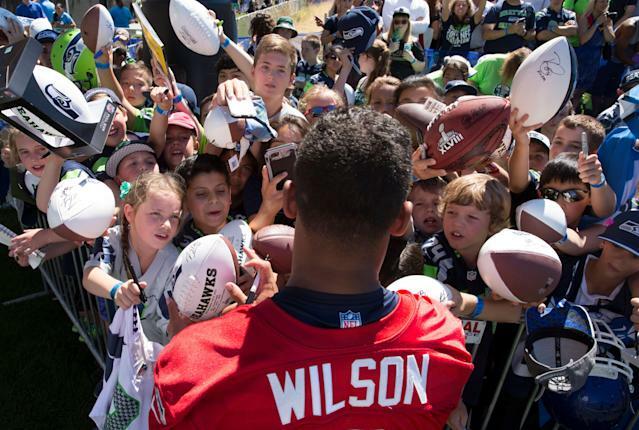 Perhaps moving on from the Seahawks is something that Wilson would prefer. Fox Sports 1’s Colin Cowherd recently floated the idea that Wilson and his singer-wife, Ciara, would be interested in relocating to New York because of the entertainment opportunities and the fact that the Giants need a replacement for Eli Manning. 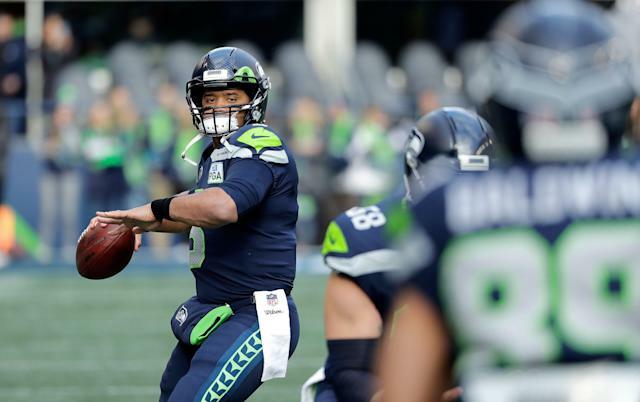 One would think that the Seahawks would do everything in their power to retain a franchise quarterback who set career-highs in passer rating (110.9) and touchdown passes (35) in 2018, while also tying a career-low with just seven interceptions. It was assumed the Seahawks would eventually get a deal done, likely this summer. But Wilson’s ultimatum was his calculated way of moving up the team’s timeline. Further complicating matters might be the fact that Seattle doesn’t like to guarantee salaries beyond the first year of a new deal, preferring instead to give guaranteed money in the form of signing bonuses and base salaries. And making Wilson the highest-paid player may not be in the front office’s plans. Wilson wants to remain in Seattle. But that decision may not be his. What initially appeared to be a power move on the part of Wilson will amount to nothing more than an empty threat if his arbitrary deadline comes and goes without a new deal. Even a player as gritty, as gutsy and as gifted as Wilson is at the mercy of management to some degree. Save for withholding their labor — which Wilson won’t do — NFL players have only so many avenues to make their voices heard across the negotiating table. Even those with more leverage than most. That said, the longer the Seahawks draw out these negotiations, the closer they get to a potentially messy situation involving the centerpiece of their team. Fallout could ensue if contract talks go poorly.